It's a fashioned alcoholic beverage that's lasted through the ages. From wine vineyards and chateau's at off-beaten towns, the history of wine has always been fascinating. And when the grapes have ripened every new day's dawn, it's almost sinful not to have a taste. That's why wine makers have always made it their mission to have their wine age gracefully. It's an intimate process from selecting the grapes to creating only the finest bottle. What's even more intimate is when a person tastes a Cabernet Sauvignon for the first time in his life which is equivalent to years of delicate care and labor. And wine should be treated as such. That's why it's important to only have the best quality of wood, furnace, and wine rack to accommodate your bottle. Can you imagine what would happen to years of labor and intimacy between vineyards if it is not tested to its perfect form? When you decide to keep wine, it would only make sense if you put this much attention to detail as the man from the chateau who studied the art form. Imagine yourself as a collector - or someone who loves a good glass of wine (obviously). Can you picture your face when you've had the perfect bottle aged for a few years and you can now finally taste it? With the grape blends battling for dominant taste in your mouth. But be warned. This isn't possible if you don't take care of your bottle. That's why wine racks were made. So nothing would happen to the perfect bottle. No kids crashing in and tripping on it. No pets that would move and make the bottle fall. Because the Wine Rack from Bella Vino was designed and engineered to withstand what could happen in the coming years. Your journey begins with a simple, "Add to Cart." HOLDS YOUR WINE PERFECTLY: Typical Wine Racks generally can't hold 750 ml - 1.5 liter bottles together. But the Wooden Wine Rack by Bella Vino was originally designed to present a sturdy foundation made of wood while also being easily expandable to accommodate all your finest selections. We know you give value to your wine, that's why we believe you only need the finest carved wine rack with the strongest foundation to ensure that your collection is lasts for years to come. YOUR COMPLETE SET: Sometimes it's always better to get your wine off the wall instead of the kitchen countertop. That's why the Wine Rack comes with a handy mountain bracket to ensure that it can stick to the wall of your home or restaurant while also giving you the option to set it on the table. Because of the Wine Rack's design, it can stand on any surface without support unless on the wall and is still highly functional when you have guests or want a bottle for yourself. YEARS OF SATISFACTION: There's a reason why wine tastes better after years of settling the grapes. By choosing a design that lasts throughout the ages, with a fully functional wine rack, you'll be able to continue drinking a glass of the best wine in your collection with a promise of a lasting tomorrow. 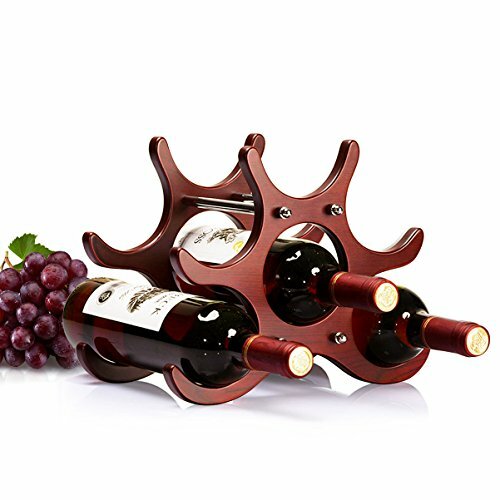 This is only made possible if you also have the most convenient and high-quality wine rack that can hold any bottle without you worrying that it will break. For many more years to come. BEAUTIFUL CONTEMPORARY DESIGN: We chose to follow a contemporary design for your wine rack because we trust that "less is more" when presenting a classic collection to your friends. By using wood for your wine rack, each contemporary design piece shows a certain type of elegance that can be brought from your home to a restaurant. The design philosophy means to "live in the moment" where contemporary designers use the promise of line and space to create a wine rack that lasts through the decades. A STRONG FOUNDATION: We crafted this wine rack using wood to create a strong foundation that allows you to put together different bottles of your collection. Not only this, but it was crafted in a way that made the wine rack expandable per section without harming its grip on other bottles. More than that, the wood enhances the smell and taste of the wine while also ensuring that nothing will be spilled, dropped, or have the quality diminished while you let the grapes settle for a few more years.